Alan Clarke’s television adaptation of Jim Cartwright’s stage play Road honors its theatrical roots while forging a uniquely cinematic experience. The end result stands as one of the screen’s most harrowing, and most darkly humorous, depictions of urban poverty’s ability to prompt alienation and desperation. These emotions are exhibited by a wide cast of characters, most of whom are either aggressively sexual young women or substance-abusing men. The codependency between these two groups and the others that exist in the cast’s periphery portrays poverty as an ingrained, inescapable social condition. Road is an ambitious work, hoping to encapsulate the state of an entire class of people in just over an hour. There’s something inherently condescending in the script’s broad generalizations of misery, but what ends up on the screen is at once repulsive and heart-rending. Clarke’s style, which fluctuates between elaborate tracking shots and grotesque close-ups, accentuates the outsized nature of the cast’s performances, but also works to create a space in which these caricatures can function plausibly. His camera roams around the slums, into derelict buildings, and out onto the streets. Often tracking tightly behind a character who’s storming down the middle of the road, the camera’s lens simultaneously enlarges the world that these people inhabit and isolates them in their personal angst. Usually opting to show only the characters with speaking parts on screen, Clarke utilizes the spaces that his cast members traverse to let us know that we’re not observing a few sorry individuals, but instead members of an expansive, entirely broken culture. Over the course of Road, several pop songs are used inventively and expressively, creating a conversation with the emotional trajectory of the film. Gene Vincent’s “Be-Bop-A-Lula” lends a dangerous sexual swagger to both the male and female characters. 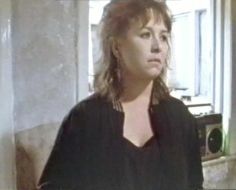 Sharon’s “I’m in the Mood for Dancing” suggests that the pub might offer escape, momentarily turning the slums into a studio backlot. Such dreams are immediately undercut, though, by an old veteran’s lament for the dance halls of bygone days. Living in a Box’s self-titled track exaggerates the misery of cohabitation in low-income housing. Mel and Kim’s “Respectable” underscores a seedy pickup, while marking the film’s one sequence that depicts the wasted community as a whole (in a rotting pub, naturally). Finally, Otis Redding’s cover of “Try a Little Tenderness”, played while Clarke’s camera segues between four close-ups, seems to express a lack in the characters’ souls, but then it improbably prompts four divergent, yet eloquent, monologues in its listeners. Collectively, in this context, these songs depict both pop’s ability to help us transcend the humdrum aspects of our lives and its coarsening, corrosive effect on a society’s ability to express itself. Clarke’s stylizations are not realistic, but they feel more effective than mere realism could be. Road’s many confessions take on a vast, almost allegorical weight due to the stylistic distortions that Clarke has devised. Its series of monologues and confrontational dialogues, usually delivered in unbroken takes by a uniformly stellar cast, are blunt, but extremely effective. They externalize the internal conflicts of these sad characters, explaining both their desires to break from their sad routines and the self-defeating impulses that keep them trapped in their way of life. The oldest characters become quasi-narrators who directly, and ironically, address the camera. Their tragedy, it seems, is to remember when England still had a shred of dignity.